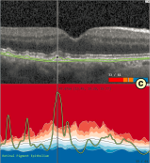 An extended version of our last year’s EuroVA paper on the visual analysis of retinal changes through OCT was now published at the Visual Computer. You can find the respective details in the publications section. Thanks to the interdisciplinary crowd in Rostock for making so good progress. Just recently, we have presented two papers at IVAPP 2018 in Madeira. One paper was joint work with my good friends from Münster about the approximation of the signed-distance function to point clouds. The other paper presents first thoughts of my good colleague Heidrun Schumann and our PhD-student Christoph Schmidt about the role of annotations in visual analytics. We have finally published the full version of the paper on our eye-tracking user study, dealing with the effectiveness of different classical visualization techniques for hierarchical data. The full text of the respective issue of the International Journal on Advances in Software can be downloaded here. 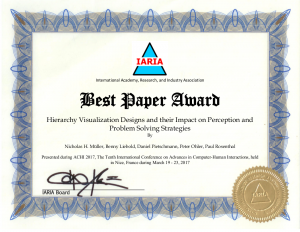 You can alternatively find the paper entitled “Visualizations for Hierarchical Data: Analyzing User Behavior and Performance with Eye Tracking” in the publication section. Last week, I have finally accomplished to pass my first official non-academic certification. 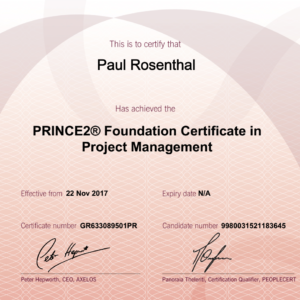 Although I now have more than 10 years of project experience, I never had a professional education in project management. 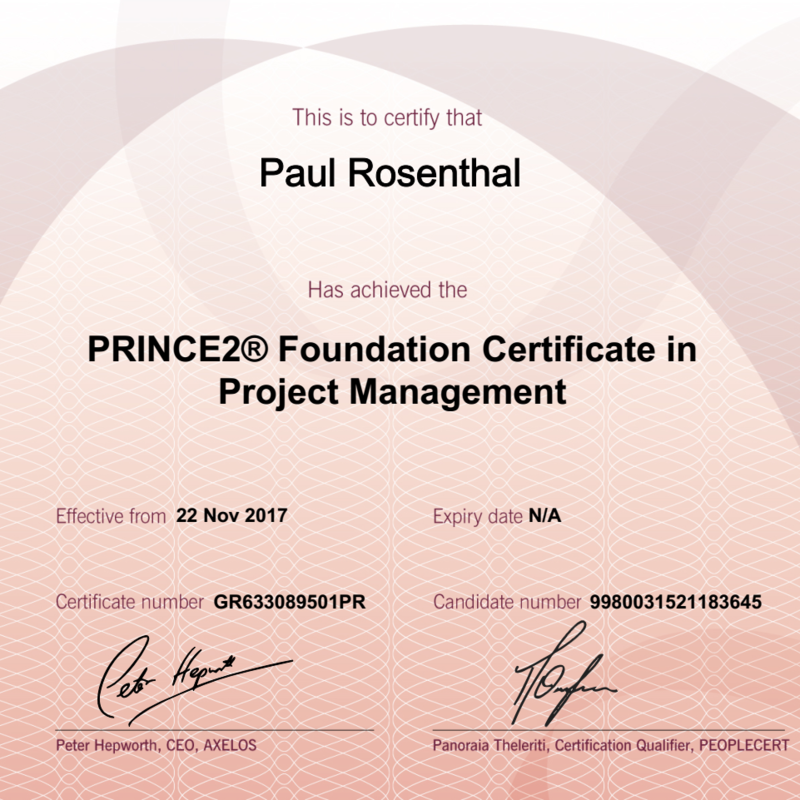 The preparation for the PRINCE2 Foundation certificate was really instructive and I see many things, I intuitively did the last years, now in a more broad way. It feels really good to keep on learning useful things. The joint work of Martin Röhlig, me, Christoph Schmidt, Heidrun Schumann, and Oliver Stachs regarding visual analytics in the field of ophthalmology was last week presented at EuroVA in Barcelona. In addition, the paper was awarded with the Best Paper Award of EuroVA 2017. Thanks to all folks in Rostock for the fruitful collaboration. This year’s ACHI, the International Conference on Advances in Computer-Human Interactions, featured two papers of different current research topics of my group. Linda and Tabea presented their preliminary results in analyzing the requirements of supervisors when visualizing work load and emotion data in air traffic control. 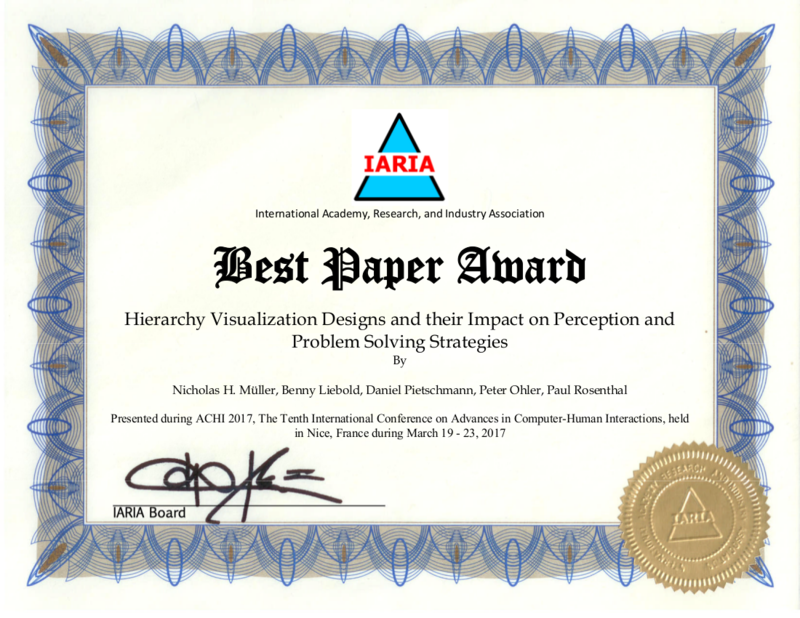 Our friends from the media psychology at Chemnitz University of Technology presented their joint user study on the effectiveness of different hierarchy visualization techniques. In addition, this paper actually won the Best Paper Award of the conference. Last week, Linda Pfeiffer presented the design study of Walentin Heft for visualizing ergonomic data to support management decisions at IVAPP in Porto. Find the link to the preprint in the publications section. It is my pleasure to announce, that I will host a special track at next year’s ACHI, the tenth International Conference on Advances in Computer-Human Interactions, in March 2017. The special track will concentrate on the interdisciplinary link between interface design and cognitive processes, ideally illuminated from both sides. The deadline for submissions is just one month away, January 15. For more information, have a look at the track’s cheat sheet 😉 or just drop me a line. See you soon in sunny Nice. I am happy to announce, that from the first of October on I am Visiting Professor, concentrating on Human-centered Data Analytics at Heidrun Schumann’s Computer Graphics Group. At the same time, I am still supervising my remaining projects and PhD students at my Visual Computing Laboratory in Chemnitz and I am looking forward to new challenges as Senior IT project manager at the German Federal State of Mecklenburg-Vorpommern. In summary: Everything is new and still stays the same.